How about a different kind of “cannelloni”? Ana, at Recetas para cocinillas, suggests this surprising aperitif inspired by the Italian classic. What do you think about changing the pasta for surimi? And a cold filling with lots of seafood flavour? 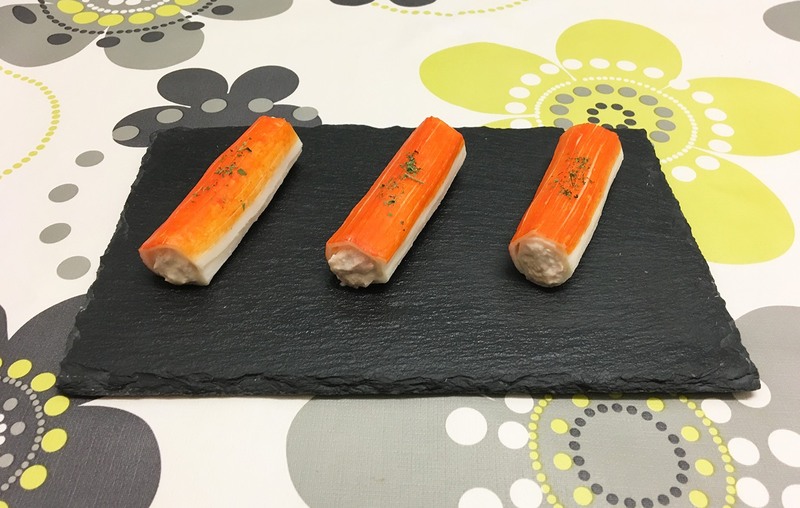 Unroll the surimi sticks and place them face down on a smooth surface. Take three Cantabrian anchovy fillets and chop them with a blender. Drain the White Tuna and mix it with the aioli and the chopped anchovies until all the ingredients are blended well into a paste. In the central part of the surimi (completely rolled out), add a spoonful of the mixture. Roll the crab stick carefully so that the filling does not come out the sides of the cannelloni. Arrange the cannelloni on plates and decorate with a little chopped parsley on top. A different take on cannelloni. Thank you Ana! Anchovy fillets from the Bay of Biscay carefully selected by “Serrats” Preserves, in olive oil and packaged in a glass jar. White Tuna (Albacore) loins carefully selected by “Serrats” Preserves, in olive oil and packaged in the most “typical” can size.